Check out Tobi's Torn Apart Distressed Tee Dress Go on with your bad self in the Torn Apart Distressed Tee Dress. A unique distressed tee/dress designed with a slight cold shoulder, loose fit, and trend setting cut outs. This cutting edge basic goes effortlessly with high heels or sneakers, so try something new on for size in this oversized t shirt style. Go on with your bad self in the Torn Apart Distressed Tee Dress. 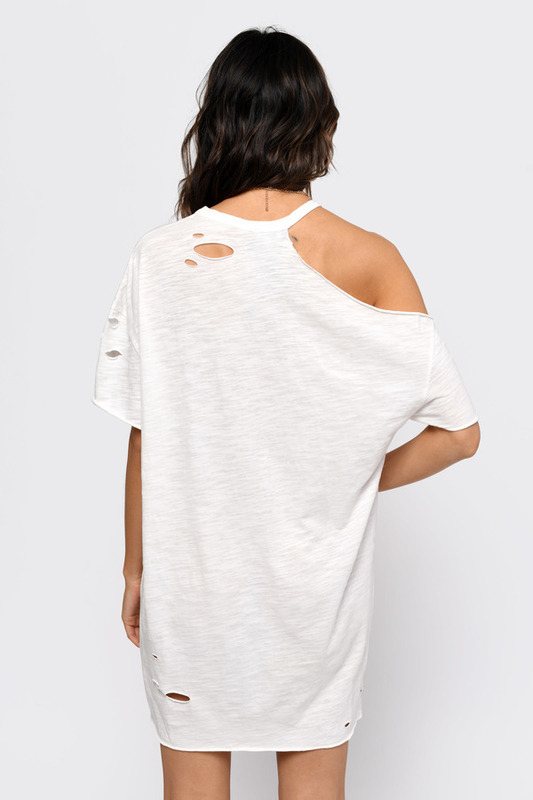 A unique distressed tee/dress designed with a slight cold shoulder, loose fit, and trend setting cut outs. This cutting edge basic goes effortlessly with high heels or sneakers, so try something new on for size in this oversized t shirt style.